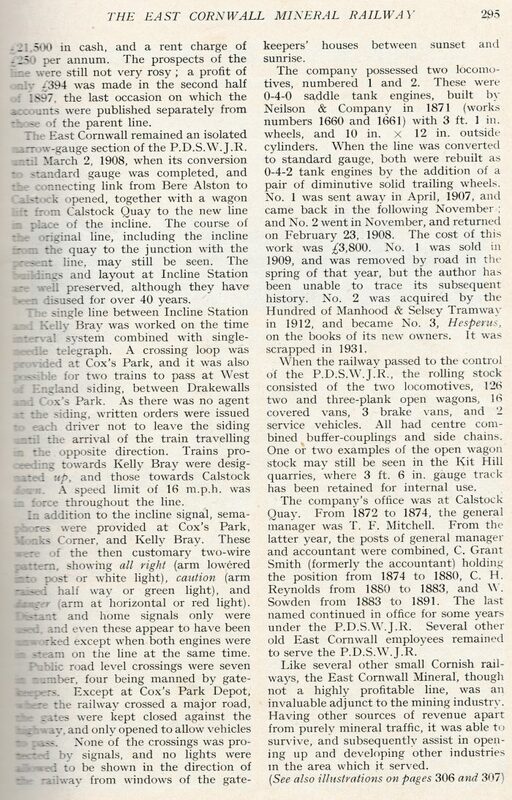 Another Railway Magazine article from 1951! 1859 – the Tamar Coal, Manure & General Mercantile Company was formed. 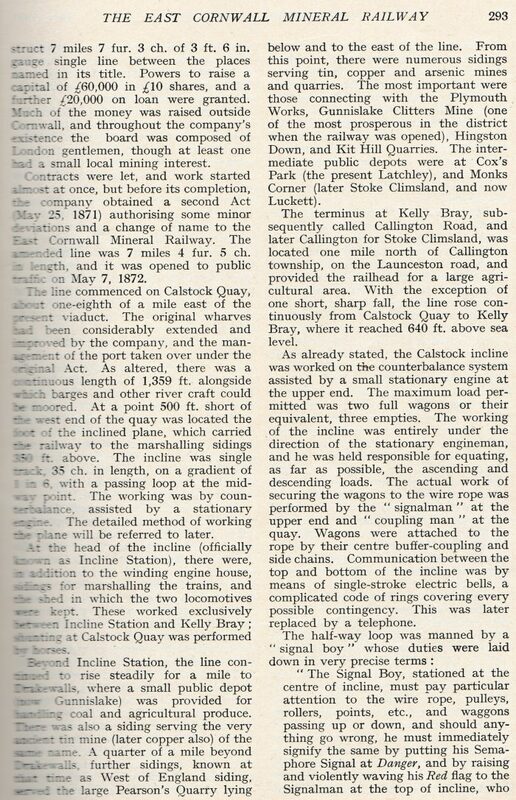 They had wharves, engine works and stores at Kelly Quay, Calstock (now called Kingfisher Quay). 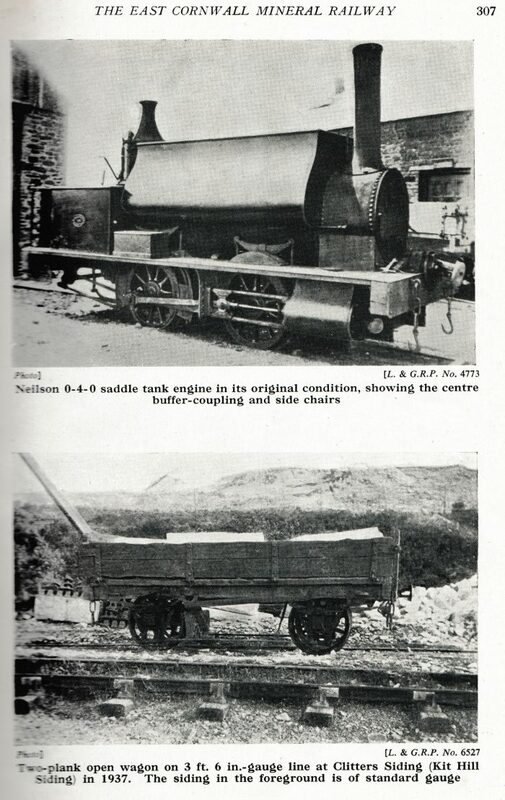 They built an incline plane from the quay up the Danescombe valley finishing 350 ft above Calstock at The Butts. 1862 – the Tamar, Kit Hill & Callington Railway Company was formed with the intention of connecting the incline to Callington. 1864 – A Bill was passed in parliament. Land and rails were purchased and work commenced. Most of the finance came from outside the region as local people thought the railway was being built too cheaply. They were proved correct as the engineering problems were greater than envisaged and the contractor found himself in money difficulties. Work was halted and nothing happened for five to six years. 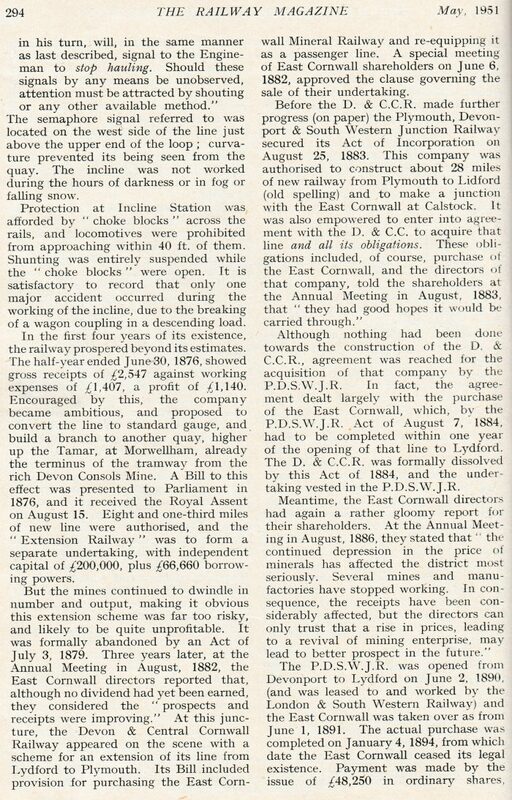 1871 – an Act of Parliament, of 25th May 1871 authorised a change of name to the East Cornwall Mineral Railway (ECMR). 1890 – the authorised PD&SWJR opened on 2 June 1890, and it was to be worked by the London and South Western Railway (LSWR). Two saddle-tank engines pulled the goods from Kelly Bray to the top of an incline. 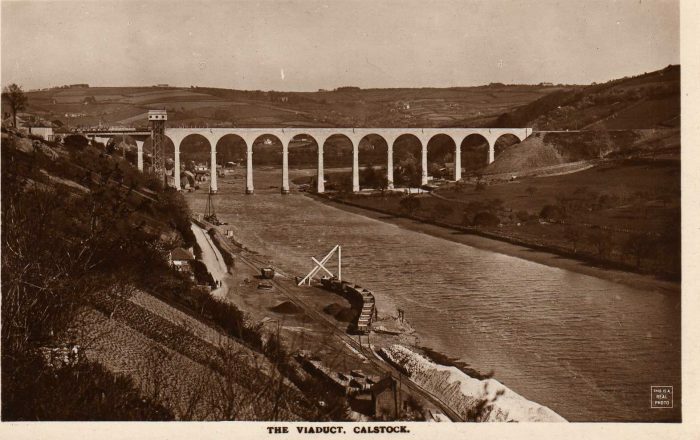 The inc;line connected the railway to the quay in Calstock.and the River Tamar. It was a rope-worked single track incline with a passing loop at its mid-way point. Two loaded wagons would be pulled up the incline as three loaded wagons descended. The wagons were then hauled along the quay by horses to the copper quay which was on the site of the present Calstock village hall and car park. Tin, copper, arsenic, bricks, stone and coal were carried and for the first four years profits were good. Gradually the mines began closing and trade began to decline, what was needed was a passenger service. This came about with the restructuring of the companies associated with the line and the development of other railways in the area. We have noted above that the extended line which included the graceful viaduct over the River Tamar ran from Beer Alston to Callington along a relatively tortuous route with steep gradients. 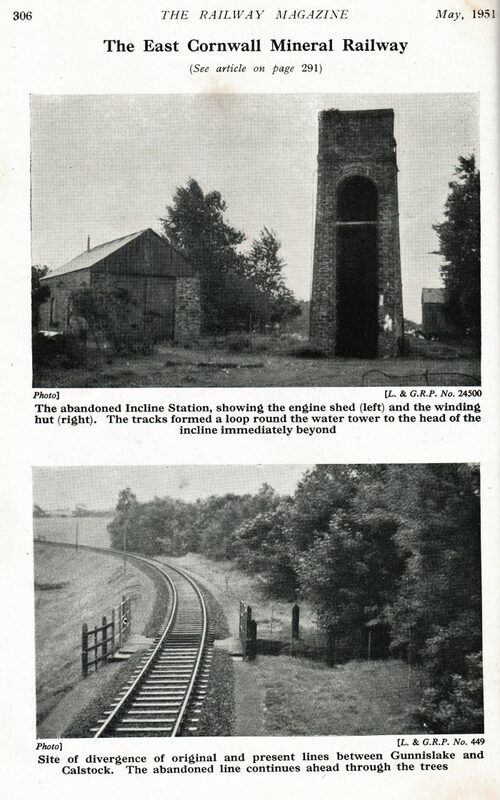 This post provides an introduction to the line which ran from Beer Alston to Callington. The next post will follow the length of the line. C.R. 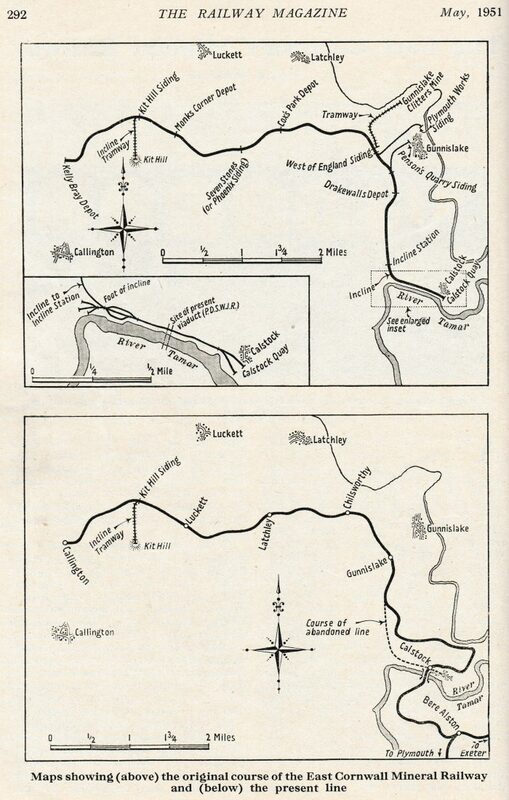 Clinker; The East Cornwall Mineral Railway; The Railway Magazine, Vol. No. 601, May 1951, p291-295. 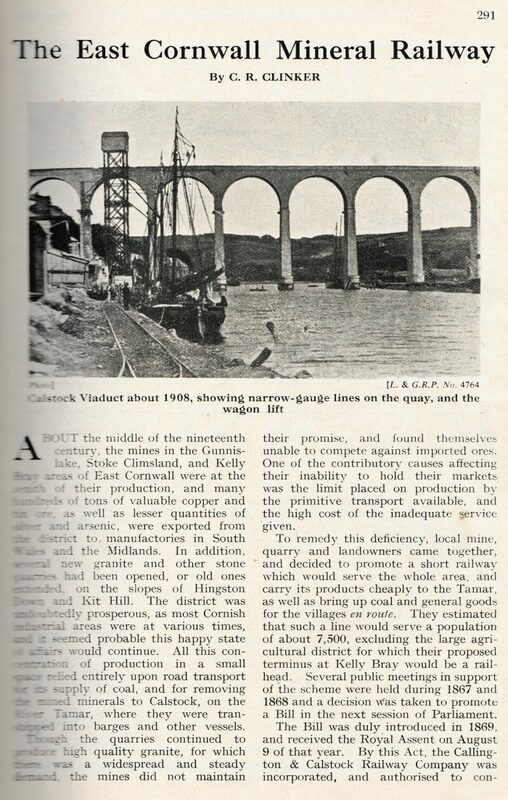 https://en.m.wikipedia.org/wiki/East_Cornwall_Mineral_Railway, accessed on 26th March 2019.
https://www.aditnow.co.uk/Mines/East-Cornwall-Mineral-Railway_10417, accessed o n 26th March 2019.
https://www.gracesguide.co.uk/East_Cornwall_Mineral_Railway, accessed on 26th March 2019.
http://www.cornwall-calling.co.uk/mines/tramways/east-cornwall-railway.htm, accessed on 26th March 2019.
http://www.cornwallrailwaysociety.org.uk/callington-branch.html, accessed on 26th March 2019.
http://www.trainweb.org/railwest/railco/minor/ecmr.html, accessed on 26th March 2019.
https://www.theguardian.com/environment/2014/dec/15/cornwall-railway-heritage, accessed on 26th March 2019.
https://www.steamlocomotive.com/locobase.php?country=Great_Britain&wheel=0-4-0&railroad=ecmr, accessed on 26th March 2019. Roger Crombleholme, Douglas Stuckey and C F D Whetmath; Callington Railways; Branch Line Handbooks, Teddington, 1967. Vic Mitchell and Keith Smith, Tavistock to Plymouth, Middleton Press, Midhurst, 1996.
http://www.trainweb.org/railwest/railco/sr/cal-intro.html, accessed on 26th March 2019.
http://www.tvia.org.uk/cgi-bin/tviagal.pl?imgno=1498, accessed on 26th March 2019.
http://www.cornwall24.net/2011/06/on-the-river-tamar, accessed on 26th March 2019. This entry was posted in Railways Blog on March 26, 2019 by rogerfarnworth.